Clean-lined contemporary character is complemented by the lush rustic touch of a smoked-brown finish in Sunpan’s Miriam Nightstand, ideal alone or in a set of two. 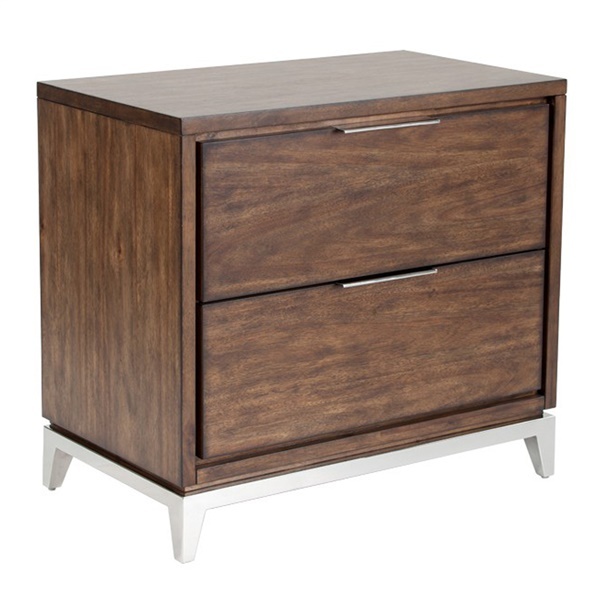 Crafted with the rugged look of quality wood accented by a sleek stainless steel base and hardware, the Miriam Nightstand by Sunpan is eye-catching yet easily assimilates into various bedroom aesthetics while also providing generous storage. Boasts a dazzling smoked brown finish. Includes two deep drawers for added storage space. Features a spacious top, enabling you to display photographs and much more. Offers a superb stainless steel base and handles. Is the nightstand solid wood, veneer, particle board, or something else? If solid wood or veneer, please specify the wood species. The Miriam Nightstand is made of Solid Pine Wood with an Acacia Veneer, finished in a smoked brown color.